RIVERSIDE, Iowa—The Iowa PGA section hosted the East and West Sub-Regional competitions for the PGA Jr. League program. The East Sub-Regional took place at Airport National Golf Course in Cedar Rapids on August 5. The team represented at the East event were Iowa City/Cedar Rapids, Dubuque, Quad Cities South, and Quad Cities North. The West Sub-Regional took place on August 11 at Westwood Golf Course in Newton. 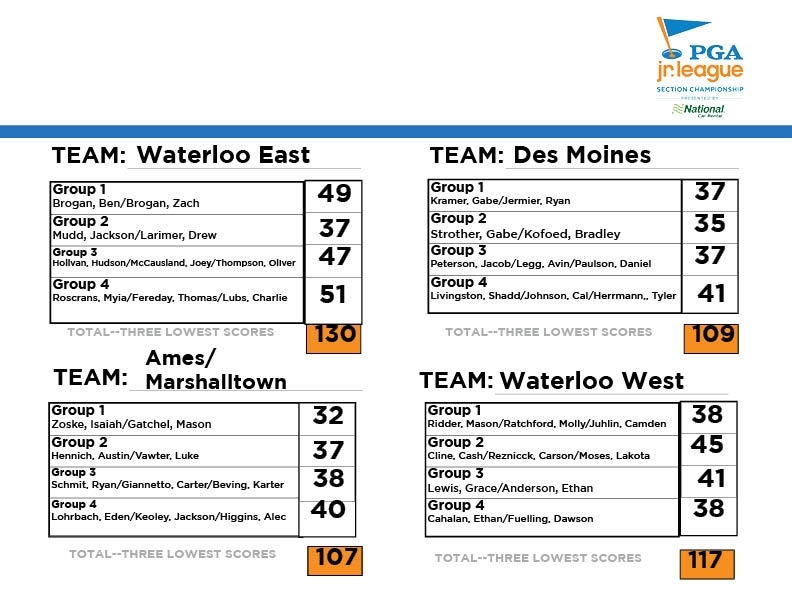 Teams represented at the West even were Waterloo East, Waterloo West, Des Moines, and Ames/Marshalltown. The PGA Jr. League Section Championship event will take place on Saturday, August 18th at the Cedar Rapids Country Club. The event will consist of two rounds of matches to determine the Iowa PGA Junior League Champion. Iowa City/Cedar Rapids and Dubuque will represent the East, while Des Moines and Ames/Marshalltown will represent the West. Congratulations to the All Star League Teams of Dubuque, Iowa City/Cedar Rapids, Ames/Marshalltown and Des Moines on their great play and for advancing on to the Section Championship. Good luck! The Regional championship will take place on September 15-16 at the Beloit Club in Beloit, Wisconsin. 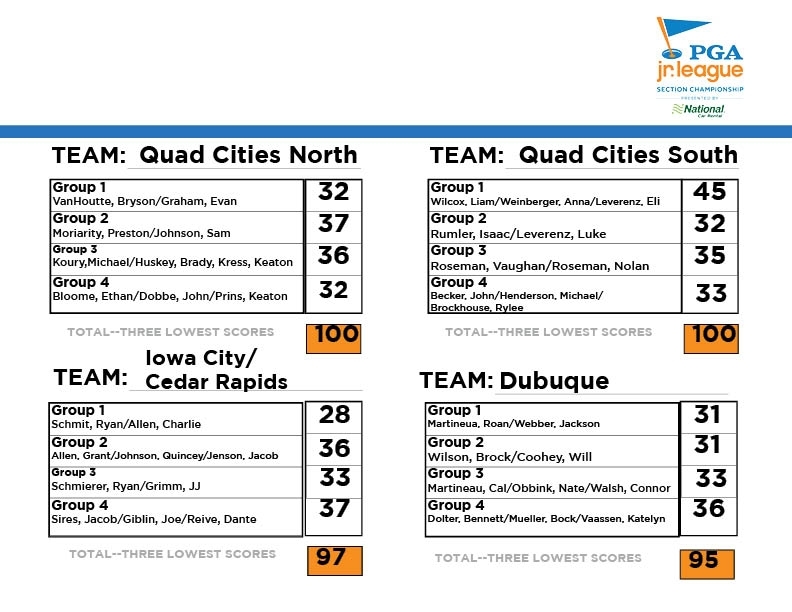 AN AGGREGATE SCORE QUALIFIER COMPRISED OF THE DUBUQUE LEAGUE, IOWA CITY/CEDAR RAPIDS LEAGUE, QUAD CITIES NORTH LEAGUE AND QUAD CITIES SOUTH LEAGUE. PLAYERS COMPETE UNDER MODIFIED RULES IN A 2 OR 3 PERSON TEAM SCRAMBLE FORMAT. AN AGGREGATE SCORE QUALIFIER COMPRISED OF THE AMES/MARSHALLTOWN LEAGUE, DES MOINES LEAGUE, WATERLOO EAST LEAGUE AND WATERLOO WEST LEAGUE. PLAYERS COMPETE UNDER MODIFIED RULES IN A 2 OR 3 PERSON TEAM SCRAMBLE FORMAT.